"A valuable contribution to the written record of Canadian crime." A Second World War veteran and the son of a policeman, Edwin Alonzo Boyd seemed an unlikely candidate for the role of master criminal. But before his career as a bandit was ended in 1952, the Hollywood-handsome Boyd cut a swath through 11 Toronto-area banks, stealing thousands of dollars and igniting two manhunts of unprecedented scope. When he and his confederates escaped not once but twice from Toronto's Don Jail, the Boyd Gang created headlines across North America and became an enduring Canadian legend. Eventually recaptured and sentenced to life imprisonment, Edwin Alonzo Boyd was paroled in 1966. After that he lived under as assumed identity, but willingly shared his memories with best-selling author Brian Vallée, resulting in this gripping account of Boyd's dubious career. Numerous others—including Boyd's former wife and various police officers involved with the Boyd Gang–also spoke candidly to the author. 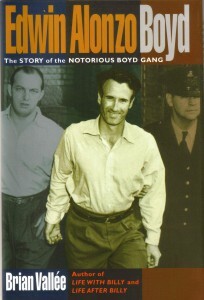 Edwin Alonzo Boyd: The Story of the Notorious Boyd Gang sheds light on a unique fragment of our history, rich with details of Depression-era and postwar Canada and alive with the insights and memories of those who lived this true-life cops-and-robbers drama. © 2019 Brian Vallee. All Rights Reserved.